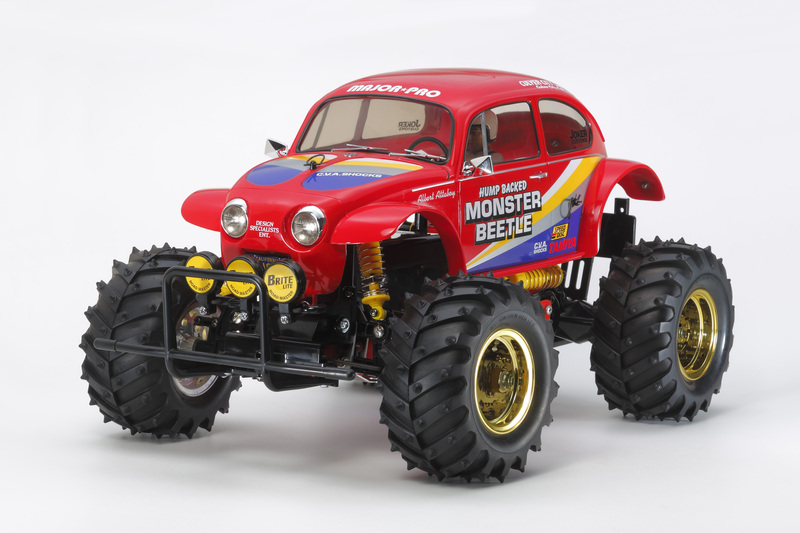 A few weeks ago we brought you exciting news about the possible rerelease of Tamiya’s famous Monster Beetle. Today we confirmed that the MB will be rereleased later this Fall with a street price around $250 and that the truck will be more true to the original and a proper “rerelease”. Our sources inside Tamiya tell use that the Monster Beetle will include a sticker sheet with many of the original decals as well as a few updates. It will also feature new rear universals drive shafts out back that operate smoothly and are housed in rubber boots, as the originals were, to protect them from dirt and debris. The Monster Beetle shares its chassis design with the original from the 80s. A closer look at the chassis, you can see that it is straight out of the 80s. 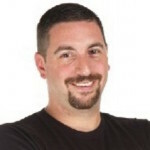 Just one major update for the rere here to make it more reliable; better universals lifted off the Frog rerelease replace the original hex bones that were prone to stripping out. 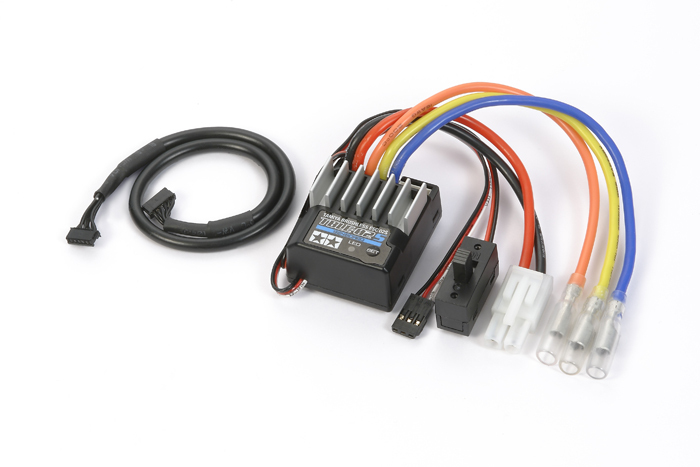 Under the radio box cover sits the steering servo and speed control to keep them out of the dirt. If the MB follows suit with the Frog rere we can expect the same updated dogbanes and maybe even a few spur gear options. 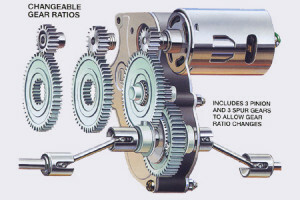 The Achilles heal of the Frog based platforms from which the Monster Beetle is derived was always its hex drive dogbones. Although they were made of hardened steel, the hex would round out after a short amount of time and slip in the axles rendering your MB immobile. For the rerelease Monster Beetle, Tamiya has updated the bones to ones like we saw on the Frog rerelease a few years back. While they’ll still be housed inside rubber boots that keep the dirt out of the works, they feature a standard dogbone design that works efficiently and is more reliable. We’re going out on a bit of a limb here but if the MB is consistent with the Frog rere, we may also get a few spur gear options with the new kit that give you the option of running two or three different ratios. Only time will tell on that one but with those big tires to turn and an entire world’s worth of running conditions, this would be a great option for the Beetle. Tamiya’s TBLE-02 brushless speedo can run both brushed and brushless for more power plant options down the road. 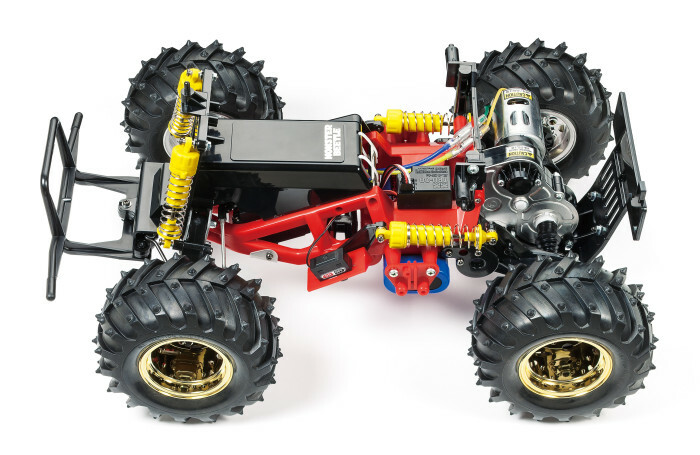 More interesting developments, the power will be delivered to the 540-size brushed motor via Tamiya’s venerable TBLE-02 brushless speed control giving this rere the immediate opportunity for a brushless motor. From the looks of the image they’ve sent us, the truck will be built on the same red ladder style space frame that the original truck was and will include yellow plastic, oil filled shocks too. The body is an injection molded design with all of the detail of the original and includes our fearless pilot Albert Attaboy behind the wheel! Stay tuned for more details as they come in as well as a full review as soon as we get our hands on one of these trucks. In the mean time here’s a look at a little bit more about the Monster Beetle as well as some other “rerelease” type projects that are now more possible thanks to this kit! The Blackfoot III is actually still in production and offers a great option to swap bodies on your Monster Beetle rerelease and build yourself a Blackfoot! 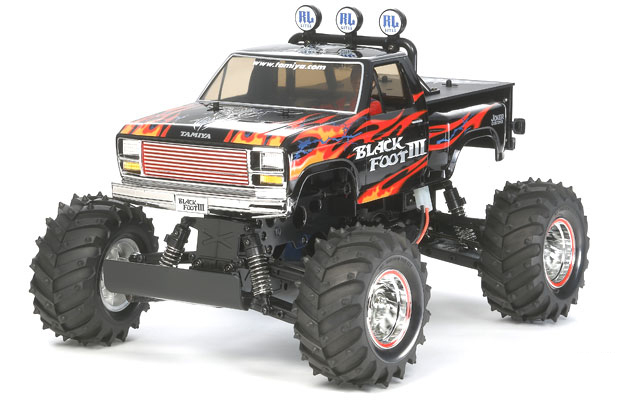 Although there are some small detail differences, the hard plastic Ford body will do most of the converting for you and from there you’ll need a little bit of creativity to come up with new rear body mounts and a few decisions as to how accurate to the original Blackfoot you want to aim for. The black friction dampers from the III aren’t perfect to the original but they’re close enough if you’re more about the looks and of course you’ll need a set of lay down rear shock mounts from the Subaru Brat rerelease. If your more about the driving side of things you may remember that anyone with a Blackfoot back in the day swapped out the shocks for the Beetle’s oil dampers. It’s all a matter of how accurate vs. custom you want to get. 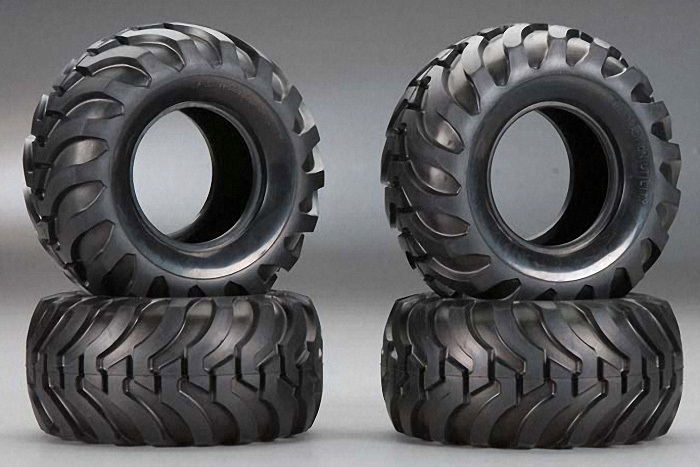 Whether you realized it or not, the tires from the Blackfoot actually came from the Bruiser (and are still available thanks to the 2012 Bruiser rerelease)! 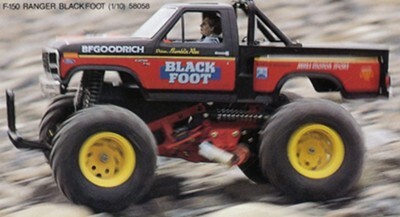 If you’re aiming for the perfect rerelease level build, you’ll probably be better off doing a little shopping on eBay rather than the current Tamiya parts bin but if you can suspend a small amount of disbelief you can even try the Ford F-350 High-Lift body and build yourself a modern day Blackfoot. 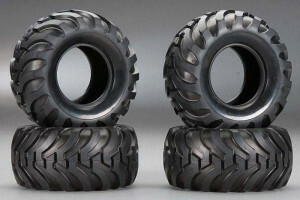 The Monster Beetle wheels will need to be stripped and painted yellow for a better match but Tamiya Bruiser tires are pretty true to the original Blackfoot and will finish off your project quite nicely! This one is definitely easier than a Blackfoot build since everything underneath the body remains the same. When Tamiya released the Mud Blaster II a couple years ago, everyone was anticipated what the Monster Beetle rere ultimately will be; the red frame chassis, etc. 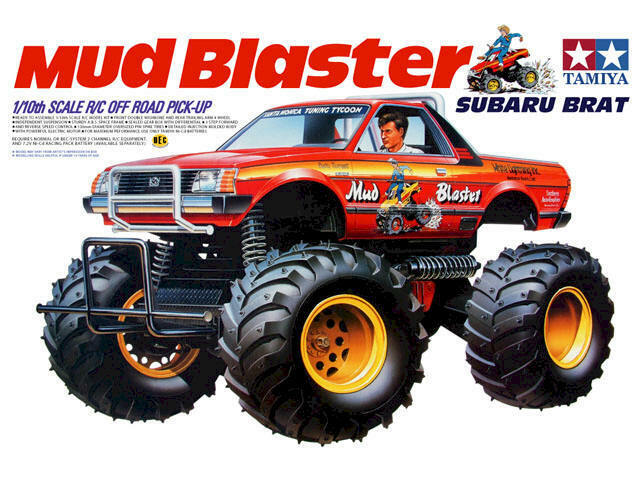 The lexan Blaster body offers a nice light weight racing option but if it isn’t your dish, there’s always the Subaru Brat body which is nearly a dead ringer for the OG Blaster. The Brat was reissued back in 2006 but is still available and offers a body thats more true to the original. Again you’ll need a custom, eBay or aftermarket rear body mount but once you have that on, you’re but a set of yellow painted wheels away from a pretty clean and authentic looking Mud Blaster. As this rig was more closely related to the Monster Beetle, the project is a little easier to to get together vs. the Blackfoot and with 99% of its parts coming straight from rere kits, you won’t be as torn to run this baby!